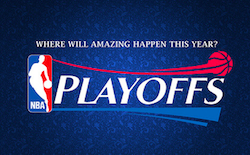 I am back to being more distracted by sports than by poker at the moment, with the NBA playoffs having earned a lot of my attention most evenings. Things are finally getting interesting there as many of these best-of-seven first round matchups have moved into the more exciting latter stages (e.g., games five, six, and perhaps some sevens to come). I’m not an NHL fan, but I’m aware their playoffs have begun as well with the 16 teams making it to the hockey postseason similarly engaged in best-of-seven matchups as they start the lengthy process of determining a champion. Was thinking today how the shifting dynamic of a best-of-seven tournament can resemble a Texas hold’em hand. The first two games of a series -- both played at the higher-seeded team’s arena -- are a bit like preflop play. Having home court/ice could be said to be like playing from late position, where you are going to be able to operate a little more freely than otherwise and where expectations of winning are greater. Then when a series reaches Game 3, that’s a bit like what happens after the flop. The first three community cards further define how players can proceed in a hand, much as the results of the first two games in a series can have influence on how teams perform going forward. Game 4 continues in the same vein, sometimes ending with a sweep (like a bet-and-fold winning the hand right there), a team moving ahead 3-1 (assuming a position of strength going forward), or the series getting knotted 2-2 (as though flop betting -- or checking -- failed to establish one player as having the “lead” or appearing at an advantage to win the hand). Game 5 is then very much like the turn. In both the playoffs and in poker, it’s the “pivotal” game or street. Again the series (or hand) can be over right here, but if it doesn’t, the team who wins Game 5 -- just like the player who plays the turn most effectively -- is often now in good position to end as winner. I’d finish the analogy by referring to both Games 6 and 7 as the “river.” I’m more familiar with the NBA, where relatively few series actually get all of the way to Game 7. But however you look at it, both of those games are like the “endgame” portion of a poker hand where final, decisive moves are being made. And I suppose when those series do get to a game 7, weird, unexpected things sometimes happen as well, much like a surprising river card that gives an underdog the win. I’d explore all of this more thoroughly, but I think before watching tonight’s games I need instead to watch “The Adventures of Christopher Bosh in the Multiverse” again, starring Miami Heat forward and superhero from Zorg-nok Chris Bosh.